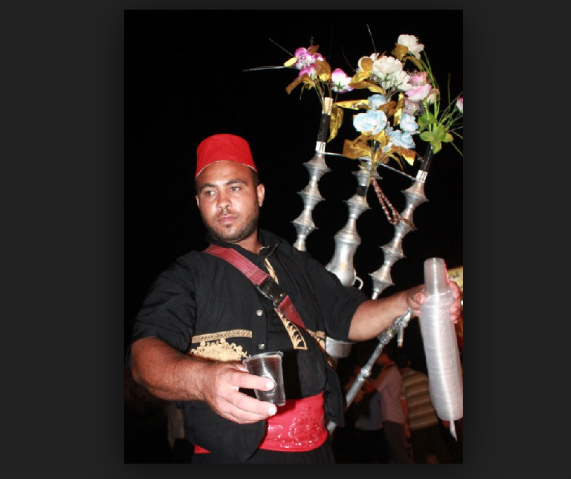 The word "Caratage" like the Arabic word "Kharoub" (Carob) Drink Seller in Egypt (photo above) - is derived from root word "Carubis" (Carob seeds) which was used in Mesopotamia (modern day Iraq) as a measure of weight. The letters: K or kt indicates the percentage of gold present in the gold alloy, with 24 karats being the highest, i.e., Pure gold. The word "karat" is derived from the fruit of the carob tree. Ahhhh Ha! Here is the confusion! The same root word has been applied for both purity measurement and weight measurement. The seed of the plant was called "carubis" in Mesopotamia and was used as a unit of weight measurement (mass, i.e., NOT purity). This unit of mass measurement was based on the carob seed, which had an approximate weight of around 0.2 grams. It was first used in Mesopotamia, now modern Iraq, to weigh gold, pearls, gemstones and everything that was deemed small and precious. Caratage by any other name? The word CARAT in Italian is called CARATO; in Arabic - QIRAT; in Greek - KREA'TION. The purity of Gold Coin Jewelry, for example, is derived from the gold content, the fineness, or simply, the quality of the gold. GP markings on gold jewelry usually indicate the metal used in the construction is "Gold Plate" and not comprised of solid gold. Many Antique Jewelry Hallmarks may include the Millesimal mark or the Millesimal Fineness. This is a system denoting the purity of gold alloys by parts per thousand of pure metal in the alloy (this system also denotes the fineness of platinum and silver). The millesimal fineness is usually rounded to a three figure number, particularly where used as a gold hallmark. For example, an alloy containing 75% gold is denoted as ‘750,’ known as 18k gold. Ask Your Hallmark Question HERE! By Following these simple guidelines about caratage, you will be able to identify, and period date Antique Gold Jewelry with a lot more accuracy. Karatage & Caratage - What's the Difference? Nothing! Gold bearing the marks "KT" or "CT" is simply determined by the geographic location of the hallmarking. Britain, Canada, Australia, New Zealand, South Africa and other countries originating from the British Empire use the abbreviation ct for carat - as in 9 carat gold, or 9ct. South East Asia, China that's-ancient-and-blue, Europe and the United States use the word karat. Jewelry originating from theses countries is often marked - 14k or 14k or 14kt, etc. To avoid confusion, Europe and the US introduced the designation "kt," to differentiate between carat (for gold quality) and carat (for gemstone weights). Diamonds are always weighed in carats and points. 100 points = 1 carat weight. One carat equals a fifth of a gram. To avoid confusion, "kt" or "k" (US standard as in 14K gold), will be used when referring to gold purity measurement throughout this site, to avoid possible confusion with diamond and gemstone measurement of weight that is also "carat". But when it comes to Incredible India, as Sita Devi's collection certainly confirms, Indian Gold Jewelry can, on occasion, be made of the highest caratage on the planet, yep, you guessed it - 24K! Antique Gold Jewelry has two distinct stores of value: The Antique store of value and the Gold store of value. If you know that Gold Prices recently crossed $1,000 once for the first time since 1980, a record high, you know why caratage counts. The higher the gold content of the Gold Antique Jewelry, the higher the antique appraisal value. Since antiquity, throughout the History of jewelry, countries and governments have kept a close eye on their gold reserves and some countries today only allow certain caratages to be even sold. In the United Kingdom, one can still make and sell 9, 14, 18 and 22 carat gold jewelry but not 12 as the latter is not even recognized by law. In other countries, such as Portugal, for example, any Jewelry lower than 12 k (50% gold or 500 fineness) cannot even be described as gold because 19.2 carats is the standard. Today, the lowest recognised standard is 8 k or 33.3% gold content that is in Germany. There are certain advantages as to why you should invest in gold of Low Caratage . For starters, there's a wider range of colors to choose from in low carat gold. It's stronger - lower the gold content and increase the strength over pure gold (999 fineness), leading to improved wear and more scratch resistant properties and jewelry less liable to distortion and damage. Below listed are the - GOLDEN RULES. ✔ Daily gold prices are quoted based on pure gold, or 24 carats. ✔ 24 k gold jewelry is theoretically 100% gold. ✔ All Antique Victorian Jewelry, Diamond-set was topped in silver to make the Diamonds appear whiter. ✔ 14 carat Gold was used for the screws and butterfly backs. ✔ White Gold was substituted for Silver in ca. 1910. 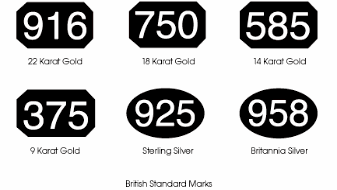 ✔ In 1854 there was a monumental change to British hallmarking, by allowing the carat number plus the decimal point, ie. 9 with .375, 18 with.750 to be marked on Jewelry. ✔ 15ct gold was the Victorian favorite. ✔ 9 ct denotes modern British Jewelry. ✔ In Chinese, 24 carat gold jewelry is also known as "Chuk Kam". ✔ 21 carat gold, fineness of 875 is the recognized standard in Arabic countries. ✔ 22 carat gold, fineness of 916 is the recognised standard in India and the sub continent. ✔ Gold has a tendency to wear away over time and decrease in volume and weight when in use. ✔ Before 1854 there were no 9ct, 12ct or 15ct Gold marked British Jewelry. ✔ 12 ct and 15 ct were discontinued in 1932 in Britain when the 14ct standard was introduced. ✔ Platinum is over thirty times more rarer than gold. ✔ The properties of Platinum allow for more intricate and finer jewelry designs than possible with Gold. ✔ The content in Platinum is indicated in parts per thousand and not in carats as in Gold. ✔ Unlike Gold, Platinum has not got a long history of use in Jewelry, anything earlier than 1900 is rare. ✔ The hardness of platinum whilst being an attribute makes it difficult to work from the jewellers perspective, and takes longer in making and finishing a platinum piece of jewellery than in any other precious metal. ✔ If an item of gold is solid and sealed by solder joins, then any part of the item can be stamped, as the mark refers to all of it.